Dingell’s Legacy • Renewable Fuel Fight • Green Nuke Deal? Former Michigan Democratic Rep. John Dingell, who died last night at 92, called himself “just a simple Polish lawyer from Detroit,” but was recognized as one of Capitol Hill’s all-time giants, particularly on energy and environment matters. “He will be remembered as one of the most influential members of Congress not to have served as president,” former Texas Republican Joe Barton, who served with Dingell on the Energy and Commerce Committee for more than two decades, once said. Dingell chaired Energy and Commerce from 1981 to 1995 and from 2007 to 2009, establishing it as one of the chamber’s most powerful panels. He was known for his “Dingell-grams,” detailed requests to federal agencies for documents and other information that formed the basis of committee investigations. He was a fierce guardian of his state’s auto industry, but also keenly interested in conservation. Dingell played a role in writing the Endangered Species Act and, after a decade of disagreements with California Democratic Rep. Henry Waxman, worked with Waxman to produce the 1990 Clean Air Act. Waxman later ousted Dingell from the Energy and Commerce chairmanship. Dingell long resisted tightening fuel-economy standards for cars and trucks. After the Senate passed a landmark fuel-economy bill in 2007, Dingell argued for differences between cars and light trucks and sought to give automakers more time to comply. Dingell subsequently added an amendment to the Democrats’ 2009 cap-and-trade bill aimed at reducing greenhouse gas emissions that restricted aid for electric cars to those developed and produced domestically. One of the accomplishments of which he was most proud was the creation in 2001 of the Detroit River International Wildlife Refuge, North America’s only international wildlife refuge. It is managed jointly by the U.S. Fish and Wildlife Service and the Canadian Wildlife Service. RENEWABLE FUELS: Corn growers and oil companies have tussled over the federal program requiring U.S. transportation fuel to contain a minimum volume of renewable fuels. Now producers of biomass, biogas, and waste energy are joining the fray. Major trade groups for the industries are asking a federal appeals court to force the EPA to implement a part of the renewable fuels standard that allows renewable electricity fuels from biomass, biogas, and waste energy to generate credits under the program. Fuel refiners and importers can buy and trade those credits as they work to meet the law’s annual biofuel quota. Biomass, biogas, and waste energy producers say a law Congress passed in 2007 requires the EPA to include their industries. But they say the agency hasn’t approved a single application. GREEN NEW DEALING: For all the attention it’s getting, the Green New Deal is far from a done deal. Supporters of the resolution, introduced yesterday on Capitol Hill, will have to struggle to build consensus on issues that divide environmentalists as well as lawmakers. Among those issues is nuclear power. Though it’s proponents see it as a potentially huge source of greenhouse-gas-free energy, many environmentalists associate it with the 1979 Three Mile Island accident in Pennsylvania, and subsequent incidents in Chernobyl and Fukushima. When a fact sheet on the Green New Deal provided by the office of Rep. Alexandria Ocasio-Cortez was distributed, a debate immediately broke out over the future role of nuclear power. Acting EPA Administrator Andrew Wheeler gives the keynote speech at the Environmental Law 2019 conference exploring the latest developments in climate, natural resources, energy, water, and other aspects of the law. The Green New Deal resolution wasn’t the only climate item unveiled yesterday: A group of senators introduced two bipartisan bills to boost carbon capture and storage technology. California nonprofit CalDesal holds its annual conference on desalinating water in Palm Springs. —Rhode Island Democratic Sen. Sheldon Whitehouse, explaining his reluctance to quickly endorse the Green New Deal resolution because of fears that opponents of climate-change legislation could use the sweeping measure to divide supporters. 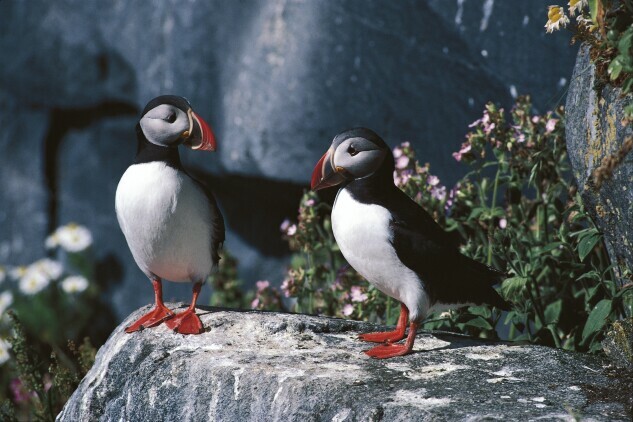 Populations of the Atlantic puffin, a colorful species of seabird in the auk family, are declining—and nowhere is the trend more evident than in northern Norway. Nesting birds in that country have decreased by up to 2 million since 1980, though estimates vary. Scientists offer differing explanations, but most point to reduced feeding stocks as a major concern. Atlantic Puffins (Fratercula arctica) roost on a rock on Vedoya Island off the coast of Norway. A warming ocean has opened up northern feeding grounds for mackerel, which consume the small fish such as herring that make up the puffins’ traditional diet, research suggests. Commercial fishing is also a factor. Most research so far has focused on identifying the cause of the decline, not ways to address it. That could change this year, when Norway’s Parliament is expected to consider an action plan for seabirds. Negotiations on the plan seek to balance the welfare of the orange-beaked seabirds with the cost to the economy and to affected industries, like most conservation efforts. TV pictures of starving chicks may tug at heartstrings, but transporting food to the beleaguered puffins is wholly impractical, Tycho Anker-Nilssen, a scientist at the Norwegian Institute for Nature Research, told Bloomberg Environment. “Feeding is only something to consider when trying to save the last fragments of colonies that are about to disappear,” he said. Florida environmental regulators implore visitors to the state’s islands to stop pooping on them. More than 100 congressional Democrats reintroduce a bill aimed at stopping President Trump’s downsizing of national monuments. Plastic contamination isn’t just being found in surface water—it’s also showing up in groundwater, a new study says. Several New Mexico state lawmakers introduce a bill moving the state toward carbon-free electricity by 2045. All Day • Energy • Columbia University Energy Symposium in New York features keynote speech by Alan James, chairman of Macquarie Capital’s Infrastructure & Energy Group. 12:30 p.m. • Energy Access/Climate • Johns Hopkins’ energy and environment programs hosts talk by Allison Archambault, president of EarthSpark International, a nonprofit incubating businesses that solve energy poverty. 2 p.m. • Housing/Energy • Energy Efficiency for All and Environmental and Energy Study Institute hold livestreamed forum on the benefits of federal housing and energy programs. Saturday, 12:45 p.m. • Climate • Citizens Climate Lobby hosts talk by Natasha DeJarnett, a research coordinator at the National Environmental Health Association whose specialty areas include climate change and environmental exposures. Sunday to Feb. 13, All Day • NARUC • National Association of Regulatory Utility Commissioners holds Winter Policy Summit.